This year’s study of 2,041 U.S. practicing physicians includes a focus on how physicians are using technology in the practice, such as for electronic health records, electronic prescribing and interaction with patients. 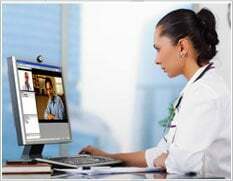 As video chatting becomes more common, this type of communication is emerging as a way for physicians to consult with patients about non-urgent issues, such as follow up questions from an office visit, or to connect with geographically dispersed patient populations that may not have nearby access to specialists. The study also found that certain specialties, such as psychiatrists and oncologists, are more likely to be using video conferencing with patients. However, the study found that physician concerns regarding reimbursement, liability and HIPAA are still major barriers to communicating online with patients. Some of these issues are starting to be addressed as telemedicine solution providers such as American Well partner with insurance companies to facilitate payment and increase their security measures. “Despite these hurdles, we still expect to see more physicians use this model to improve practice efficiency and expand their patient base, without the overhead associated with only in-office visits,” Ressi said.